Eleven-year-old Melody has a photographic memory that makes her the brightest kid in her school. Unfortunately, most people--including her doctors and teachers--believe she can't even learn.That's why her school days drone on with the same preschool lessons again and again and again. Unable to talk, write, or walk, Melody longs to tell what she thinks and knows--but she can't. Trapped inside her own body, she often feels driven to the brink of insanity. And then one day, she discovers how to "speak." For the first time, hope sweeps over her. She has a voice at last But is everyone prepared to listen? 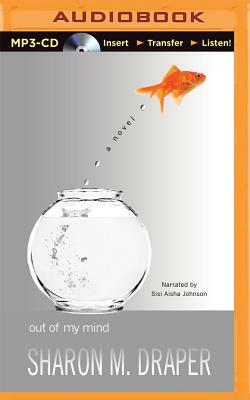 Richly textured by Sisi Aisha Johnson's enthralling narration, Out of My Mind, by ALA Best Book honoree and Coretta Scott King Award-winning author Sharon M. Draper, is an unforgettable tale of heartache and hope--and of one girl's struggle to prove the "experts" wrong.